[Performance] Control and Spin are excellent. Moderate momentum and control, balance-based all-round type. Rich "Sanarion" series is here! It aims to cut Man! Shake for the cut　"Sanarion D" ! Penholder Chinese pen　"Sanarion C" ! Japanese-style pen angle round　"Sanarion R" ! Inverted pen angle round　"Sanarion RH" ! Perplexity （Experience：１１〜２０ years）	I think that it is not suitable for beginners · · ·. It seems to be suitable for beginners. The problem is plate thickness. It is slightly thicker with a notarized value of 6.4 mm. Because of this, there is little bending. Although it does not fly, it is difficult to spin, so balls tend to be shallow. In order to beat deeply, it has to be strongly repelled. It is not suitable for athletes aiming for drive type. It is obviously not suitable for a beginner to develop a sense of rotation. While stiffening the board, the shot feeling is blurry. When applying soft rubber such as fly at soft or Vega elite, the feeling of shot feeling is not transmitted much. This too is not suitable for remembering rotation. I have tried various rubbers, but there is no use for saying this. To say strongly, the most sensation was good when sticking grain height. Since the ball separates soon, changes tend to occur with attacks, and the ball easily shakes. Although it may be good for a type that attacks with grain height rather than block main battle. It is really a racket for beginners. I think that it will be around when you get used to serve and receive for about half a year. I think that we can use it until intermediate level. Everyone is said to be "for beginners", but you can use it even if you are at intermediate level. I can use it for all round, so I love it. I used it in the first racket. Grip is easy to grasp. However, because there is not much momentum, it is not suitable for intermediate and advanced users. 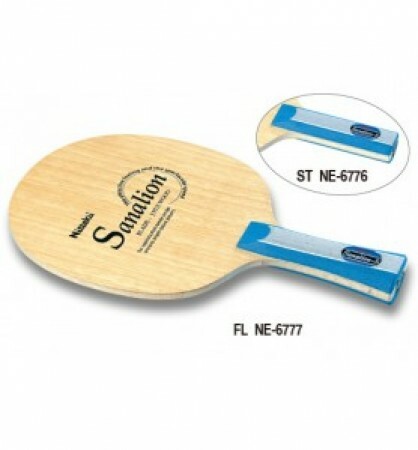 I used it when I started table tennis. I think control is also easy and I think that it is good. It has a distinctive sound like Khan when struck and it feels really good.